We had the pleasure of being a part of Leah’s 1st Birthday Party this weekend! This was our first Express & Create venture for such a young hostess – but we couldn’t have been happier to have been included! 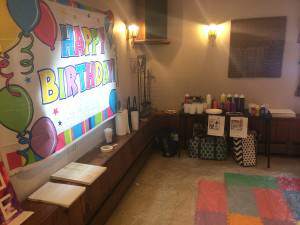 We were asked to provide a craft for the kiddos to complete during the party – something that would keep their attention! We found just that. A perfect mix of creativity and practicality. We used 11×14 canvas, masking tape, and paint! Each child’s masterpiece came out different – always one of our favorite parts! We had children attending ranging from 9 months to 5 years. For the younger kids, we used non-toxic finger paints…for obvious reasons. Some parents were brave enough to allow their older children to use acrylic paint. Of course we covered all of them in aprons! We supplied both paintbrushes and sponges as tools for the kids to create their pieces. 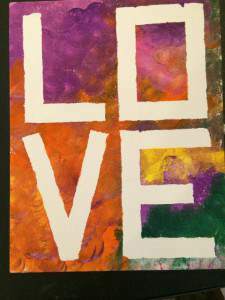 We spelle d out the word LOVE in tape and allowed the kids to paint the entire canvas….thus revealing the word in the negative space. They all had a blast – and the parents were all so pleased that their child had something fun to do…and that they got to leave with what they created! This craft was just in time for Valentine’s Day. We love being a part of birthday celebrations – as they are such a happy time. When it comes to crafts and options, like we have said….endless possibilities! Any chance for us to share our love for all things creative is something we welcome. As you can see, there are no age limits to fun, laughs, and creativity!